Practicality and maintenance of rooms directly exposed to water and moisture (bathrooms, sanitaryware, kitchens) are of primary importance for leading a healthy and normal life. Thus, their construction, repair and reconstruction require particular attention and precision. Problems which facility users face are not only functional and esthetical but also damage the facility’s structure, walls and floors. Correct installation of a waterproofing system is vital to these areas. It will ensure unhindered facility use, and easier maintenance and repair of installation defects. It is important to create a good technical design by giving priority to the right choice, use and installation of materials. Waterproofing includes installation of a system that will ensure complete water and moisture proofing of the area (floors and walls). For this purpose, apart from applying a waterproofing coating, it is necessary to seal all critical joints, penetrations and expanded areas. Failure to consistently observe this principle leads to a high probability of a leakage when the room is in use. In order to avoid leakage and all leakage-related problems, it is recommended to have a timely, systematic and precise installation of a waterproofing system in all rooms that have plumbing and are exposed to water and moisture. The area where the waterproofing system is to be applied should have a good drainage system and a sloping cement screed for discharge. Quality cement-based mortar should be applied for the sloping cement screed to create a compact substrate for the waterproofing system. In case of large areas, the substrate should be divided into individual surface areas of 9-12m² and the ADINGAKRIL elastic joint sealant should be applied to the joints. Floor and wall surfaces should be sound, clean, stable, grease-free and dust-free to ensure successful installation of the waterproofing system. The whole floor surface and the surrounding walls (such as a pool or a tub) should be covered by the waterproofing system. In case of reconstruction or repair, it is necessary to remove all unstable parts and to clean the structure from dirt and dust. Segregation and cracks in structures should be repaired. Substrate cracks should be open lengthwise in the form of a slit with a width of 0.7-1.0 cm. After being open, they are dusted, watered and filled up with REPARATUR MALTER F, polymer-modified cement-based mortar used for repairs. To finish the dry and dust-free substrate crack you can either seal it with ADING self-adhesive butyl tape or apply a coating of ADINGAKRIL elastic sealant. Before installing the waterproofing system, it is necessary to seal the joint between the surface and the syphon as well as the penetrations of all installations that go through the floor. To this end, a gap of 0.5-0.7 cm should be opened up, dry-cleaned and dusted. In the end, it should be filled up with ADINGAKRIL elastic sealant. - Applying a finishing coat of ADINGAKRIL to the joint after the last coat of HIDROMAL FLEKS has been applied and completely cured. Appropriate and quality materials should be chosen. When waterproofing sanitary blocks, HIDROMAL FLEKS (EN 1504-2) – the leastic cement-based polymer-modified waterproofing system – is used. It is simply applied as a coating. It bridges microcracks. It is applied to a wet surface and it enables ceramic tiles to be fixed directly on top of it. It is excellent for reconstruction and repair due to these properties. After being applied, HIDROMAL FLEKS becomes an integral part of the substrate to which it has been applied and cannot be removed or lead to ponding of water. The compatibility of the cement-based system, the polymer-modified cement-based waterproofing, the cement-based waterproof adhesive for tiles and the cement-based joint sealant as layers that complement the waterproofing system, ensure significant protection and remedy any possible defects that could result from sanitaryware use. Concrete, cementitious mortar, stone and plasterboard sheets can be used as a base for HIDROMAL FLEKS waterproofing system. It should be sound, clean, strong, stable and grease-free and dust-free. It is prepared by mixing component A and component B in a ratio of 1:1 by using a slow electric mixer with low number of revolutions until a completely uniform mixture is obtained. It should be applied in three layers by using a brush or a wool roller. HIDROMAL FLEKS layers should be applied once the previous layer has dried off and the application should be perpendicular – at an angle of 90˚С to the previous one. Joints and corners between the floor and the walls as well as between walls should be sealed up with ADING self-adhesive butyl tape with a maximum width of 10 cm and placed between the first and second layer of waterproofing. The adhesive tape should be applied to a dry and dust-free substrate by pressing it in with a roller. Any potential mechanical damage to the surface treated with HIDROMAL FLEKS can be simply repaired by applying another coat of it. Before the finishing works, it is necessary to check whether the waterproofing system has been successfully installed, i.e. whether there are any leaks. Once you establish that there are no leaks, the finishing works for fixing the ceramic tiles can start. HIDROKOL S waterproof tile adhesive should be used to fix them directly to the HIDROMAL FLEKS waterproofing. The adhesive is applied to the entire tiling surface by using a notched trowel. As a result, the tile fixes and fits the substrate better (on the whole surface), while the surface below the tiles is protected from water and fungi and is resistant to harmful influences that cause unpleasant odour. 24 hours after the tiles have been fixed, they should be sealed with FUGOFIL waterproof joint sealant, which together with the tiles, forms an additional protection barrier in the waterproofing system. 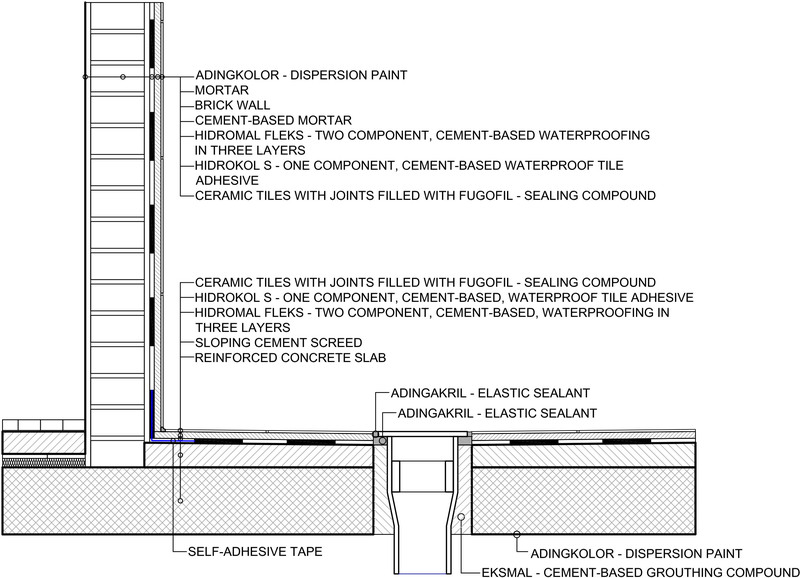 In case of waterproofing of larger areas and expansions where the substrate contains construction joints, they should be matched by the tiled surface, and the joints should be filled out with ADINGAKRIL elastic sealant. The same type of sealing could be used for additional protection of critical joints. Installation of a waterproofing system during the construction stage in rooms exposed to water and moisture is necessary to ensure intact and functional space. It should be undertaken systematically and precisely with the use of quality and appropriate materials. The progressiveness and the method of installation are crucial to successful, long-term and unhindered use of the facility. Otherwise, we would be left with nonfunctional facilities in an attempt to make financial savings. Additional waterproofing increases the facility’s price and there is often a risk of impossibility to find a different technical solution.